Another day spent with a lot of interesting people, but first I enjoyed Lori's good breakfast at the Clichy Inn, and then I got ready for today's program. Charlotte and Bill had arranged a meeting with others interested in the Dooley story, and this meeting was to take place in the rooms of Statesville Historical Collection, a stunning exhibition in the city center. It was lovely weather, sunshine and not too hot, so I walked the half a mile from the inn to the exhibition. That is to say, as I was in a good time, I took a stroll around the city center and saw a few places that I might well, have seen before, but not really looked closely at. When the clock approached 11, the agreed time for our meeting, I went down to N. Center Street, where the exhibition is housed, and as I was the first to arrive, I sat down on a bench outside the building, but shortly after Steve Hill, who founded the collection and continues to run it with a number of volunteers from the Preservation Statesville organization, arrived. The learned assembly in Statesville Historical Collection. From left David Reynolds, Karen Reynolds, Cathy Cash, Rob McHale, yours truly, Steve Hill, Bill Barnes, Charlotte Barnes and Tom Poston. We had just time for a short chat before Charlotte and Bill arrived. They had returned to their home in Matthews the previous night, and and had driven the 50 miles to Statesville this fine morning. Soon after everybody else arrived for the meeting. Those who ended up attending were Karen Reynolds, author of the play we had watched the day before, and herself an actor (not in that play) but in movies and TV shows; she arrived with her husband David. Rob McHale, singer, songwriter and musician that I had met the previous year, Cathy Cash, head of the local country music radio station and chairman of The Tom Dooley Project, an organization that makes various events around Tom Dooley in Statesville, and finally Tom Poston, who is one of the volunteers that helps to run the collection. Tom is 97, so it's pretty impressive that he can still do all that he does, but obviously he can. 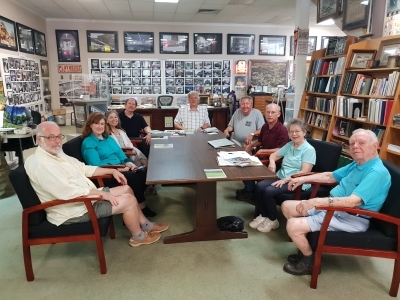 Along the way, through our séance, others appeared, most just to listen, among others, some of the other volunteers from the exhibition, but also a newspaper journalist from Statesville Record and Landmark, the local paper, whom Steve had invited. Whether it resulted in an article, I don't know, but at least he was present and took notes and asked questions along the way. We talked for about three hours and I had the opportunity to give all the participants a copy of my Western North Carolina guidebook. It doesn’t sell many copies, but it was fun to write and see oneself in print. After about three hours’ time people had to break up as they of course had something else to do. Cathy had to go back and take care of her radio station, Karen and David had to go back to Fort Hamby Park and prepare for the evening's performance of the play, Steve had work in the exhibition to do and Tom was to help him with that, as was a few other volunteers who had appeared. The only ones who didn't have anything specific to do were Charlotte, Bill, Rob McHale and I, so the four of us decided to visit some different places in town. The first place we went was Depot Hill, where Tom Dooley was hanged in 1868. On previous occasions I have tried to located the place myself, with three different results, which the Tom Dooley pages on my website have reflected, but now with expert guidance, I actually found the place where it is most likely that the hanging took place. It turned out to be pretty much where I had my second guess about where it might have been, and thus both my first and my third and last guess were wrong, and I have to correct the article on my homepage at some future time. 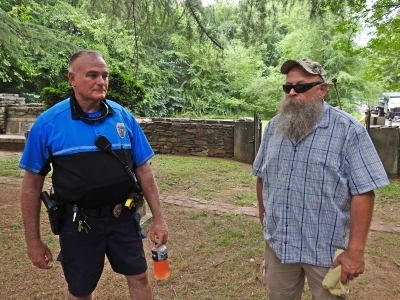 When we had seen the supposed place of execution (today just a lawn next to a street) we headed back to the center of town, to visit a cemetery, the Third Street Cemetery, where Bill had found out that the man who had been the jailer when Tom Dooley was in the city's jail, was buried. And since I have something for old cemeteries, I also thought it was a good idea. Tony, the biking policeman and Scott, the cemetery expert. We quickly found the jailer's grave, which is marked with a tombstone adorned with a "chain". Whether it symbolizes his job or whether it had a different meaning, I don’t know. We then discovered another grave, where a certain Dr. Campbell is buried. It was this doctor who declared Tom dead after the execution, so there were two people conneced to the case, who were buried at this small cemetery. As we walked around the place, two gentlemen came along. One was a policeman that Charlotte and Bill already knew, and together with him was gentleman with a long beard, who they didn't know. Tony, the policeman was on a bike patrol in the city center, but as not too much was happening on this Friday afternoon, he had plenty of time. The bearded gentleman was called Scott, and I don't know what he was doing, but he knew everything, or at least almost everything about the cemetery, and he had made a record of the individual graves, with some remarks about whoever was buried there. He and Bill got into a longer talk, and Bill could tell him that Dr. Campbell had been present at Tom Dooley's execution, which Scott didn’t know, so it was duly noted in his notebook. Scott also showed us some other interesting graves, including the oldest grave in the cemetery, dating back to 1751, and he could tell a very interested Bill that the following week, they would carry out a survey of the cemetery area with ground radar, among other things for to find out the exact extent of the cemetery, as it was believed that some of it might be below the modern streets that surround it on all sides. Eventually, however, it was time to say goodbye as Charlotte and Bill had agreed with Cathy Cash that we were going to the radio station to watch the recording of one of their radio shows, so we said goodbye to Scott. Tony had left earlier as he had a job to take care of. So we drove to the radio station, and said goodbye to Rob McHale, who had parked his car somewhere nearby. Charlotte, Bill and I went inside and greeted Cathy, and then we went into the studio, where a couple of guys who call themselves The ChillBillies (when they are on the radio) were making a broadcast with a couple of local country musicians whose name I have unfortunately forgotten. The ChillBillies interviewed the two musicians and in between they of course played some of their music. From time to time there was a break where music was played from the station's playlist, and then we talked with both the hosts and musicians. After such a break, I was called to the microphone to do an interview. It was obviously something Charlotte and Bill had arranged, so I was interviewed about what I was doing in Statesville and why, so I used the chance to advertise my book again. I was also allowed to choose a song, a country song of course. Here I should probably have chosen The Ballad of Sally Ann with Country Sisters, which right now is my favorite in that genre, but I had the feeling that they probably didn't have much Czech country music in their archives, so instead I chose The Wreck of the Old 97 which they had in a version with Johnny Cash. Overall it was a fun - and surprising - experience. So now I have been in a North Cartolina newspaper, made a podcast and also been on the radio in North Carolina; way to go, Jan! When the broadcast was done, Charlotte, Bill and I went to Risto's Place, an Italian restaurant next door to the radio station, and one of its sponsors, and here we had an excellent dinner, to which I drank an also excellent, local cider. After dinner Bill and Charlotte gave me a lift back to the Clichy Inn, where Charlotte and Bill just went in to say hello to Lori whom they knew aforehand. It was Charlotte who had recommended the place to me, and thank you for that! I have already booked my next stay there in April 2019. I am looking forward to get back to North Carolina, and meet some of these wonderful people again. This trip gave me 8 or 9 new Facebook connections, so I still keep in touch with most of the people I met. This was btw the only day of the whole trip, I didn’t use the car at all, so no registered mileage.